You are here: Home / Doctrines of Grace / Lazarus, Come Forth! Yesterday I shared on the two kinds of calls that we find in Scripture. The general call, we learned, is the call to repent from sins, turn to Jesus, and be saved. This is the invitation that flows from every true Christian pulpit, and every Christian who bears witness to Christ. Then there is the internal call. This includes the general call and the effectual call of God who makes sinners willing and able to respond. The best illustration of the internal or effectual call is recorded in John Chapter 11. Here we are told that Jesus arrives in Bethany where Lazarus has already been dead for four days. It is a grotesque but terribly accurate picture of our own spiritual and moral decay. Then we read, “The man who had died came out, his hands and feet bound with linen strips, and his face wrapped with a cloth. Jesus said to them, “Unbind him, and let him go.” (John 11:44). One of the greatest misconceptions regarding the doctrines of grace or Calvinism is that is undermines zeal for evangelism. Nothing could be farther from the truth. In fact, the doctrines of grace, rightly understood, will actually produce a holy boldness because the truth of salvation has been settled in eternity past. It does not rest in the hands of man. Once again, I’d like to share something from Boice and Ryken’s, The Doctrines of Grace. Here they explain how the raising of Lazarus from the dead is a picture of the Triune God at work raising a spiritually dead sinner to eternal life in Christ. Amen. And about evangelism and Calvinism. Calvinists were the first in the mission fields. Historically all great missions were from Calvinistic Christians. That passage about Lazarus also reminds me of the Creation in Genesis where God by his breath breathed life into Adam. 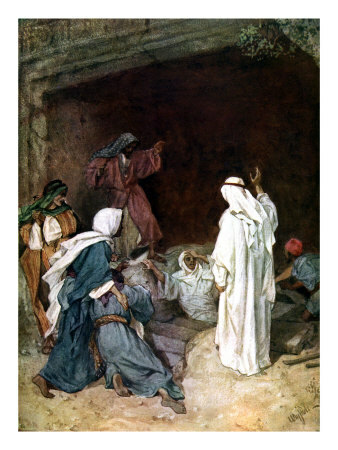 By his breath He called Lazarus to come forth and live. Thanks for the encouragement, Christina. Sometimes it is easy to get disheartened, but salvation comes from the Lord and Him alone. Great example to give…using Lazarus. We also used that in our Sunday school class and it really made an impact. Indeed, Calvinists care about preaching the Word and reaching those who have not heard the Good News of our Lord and Savior. So happy and blessed that you are teaching this Christina. So important that others know what they believe and why they believe it! Wonderful post Christina! We should never be discouraged by people’s immediate response to the message either. Recently a woman contacted us thru our business website to inquire of our identity. She was looking for Robert and I because we had both shared the Gospel with her back in 1975. I don’t remember her at all even though I had given her a Gospel tract and told her about Christ. She told me that she had scoffed at the tract and the Gospel but was saved 2 yrs later and she and her husband had served as missionaries in England all these years. She had always wanted to track us down because that was her testimony of hearing the Gospel message. On the flip side – In 1971 I met an older lady, who was a single missionsary to India, in the Minneapolis bus station when I was 19. She shared the Gospel with me and gave my friend and I a tiny little Gospel tract she had preciously carried in her wallet for 25 years. It was a sacrifice for her to give that to us because it meant so much to her. Never had a clue who this lady was. The Lord began to convict me of my sin and both my friend and I were in a terrible car accident together a year later and I broke my neck. We were both saved that night. Fast forward 15 yrs and Robert & I were in church in Sacramento, CA one night and during “testimony time” I stood up and shared my story. Afterward an elderly gent approached and said he may know who that missionary was and if it was the same woman, she was retired and living within 2 hrs of us! I found the phone # of the woman he had in mind, called her and asked if she had happened to be in the Minneapolis bus depot in 1971 and had happened to witness to two young hippie girls. She immediately asked if one “had a guitar”. That was me. We both bawled on the phone right there. Then, it “just so happened” that I was scheduled to give my testimony at a large women’s retreat in Northern California that spring and she was already planning to be there!!!. I went, shared my story with several hundred women, told all about her and went to find her afterwards. I learned that she could not make it because she had been suddenly dx’d with a brain tumor!! We talked several times on the phone after that – it was bittersweet, but we will meet in Heaven!!! Sorry, about this crazy long comment Christina. Your post really resonated with me. Did I already tell you these stories? I’m getting senile.